I really enjoyed the JKS World Championships, a really motivational experience, but what has almost haunted me since was a few words from our Chief Instructor Kagawa Shihan. Para phrased it goes something like..." The only way you can be the best you can is to practice every day". I don't know if I will ever get the opportunity to train everyday, but I thought I would give myself a chance and build my garage dojo. Above - The past and the present. SSKC has a very long history and I am very fortunate to have some of the old JKA Europe mementos, to hang next to the new banner that first hung at the 2011 World Championship. Our Club was part of the IJKA Europe association, under the direction of Kato Shihan for many years. Myself and Rebecca are indebted to the personal direction and strong Karate foundation that Kato Shihan and the IJKA provided us. The future, a number of the clubs senior grades are hoping to make it to Japan in the Spring. Please double click on flyer to open in your image viewer, New Location : same times The Sports Hall, Manor CE School, Millfield Lane, Nether Poppleton, York, YO26 6PA, new flyer posted below. 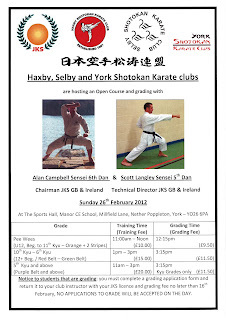 Please note that Selby SKC will not train on Sunday 27th November as all the instructors will be in Nottingham. SSKC Black and Brown belts, get out there and get known around the JKS and look forward to 2012 it is going to be a great year for SSKC, Osu! Many thanks to Sensei Mike Gude 5th Dan, Chief Instructor from Haxby Shotokan Karate Club who travel to Selby tonight to grade a few of our Pee Wees who could not make the course with Sensei Alan Campbell last month. Molly was grading for 10th Kyu and Phoebe and Lydia were grading for 12th Kyu. I think it was Selby's first all girl grading. Lydia has been training since March and Phoebe started in June training twice a week and some extra special garage dojo sessions with her Dad, Sensei Ian Culpan. A good standard all round , I was particularly pleased with the Strong Osu! Ki-ai! and spirit shown by all, Bex's Ninjas go from strength to Strength. Phoebe and Lydia, you now have your own member page and you are listed in the members table, just Click on the "Members" tab in the side bar and then click on your name.